Baan Zoe is for discerning travellers in search of genuine luxury. This incredible 580sqm villa is located in vast gardens (3200 sqm) that boast a freeform saltwater swimming pool; a guest bungalow ; and a pétanque ground with bar and barbecue corner – all in addition to the beautiful tropical foliage. The villa décor is a stylish mix of East and West; and old and new: an antique teak dining set from the north of Thailand stands alongside a kitchen filled with modern European appliances, while a baby grand piano graces a living space with chic Italian leather furniture. 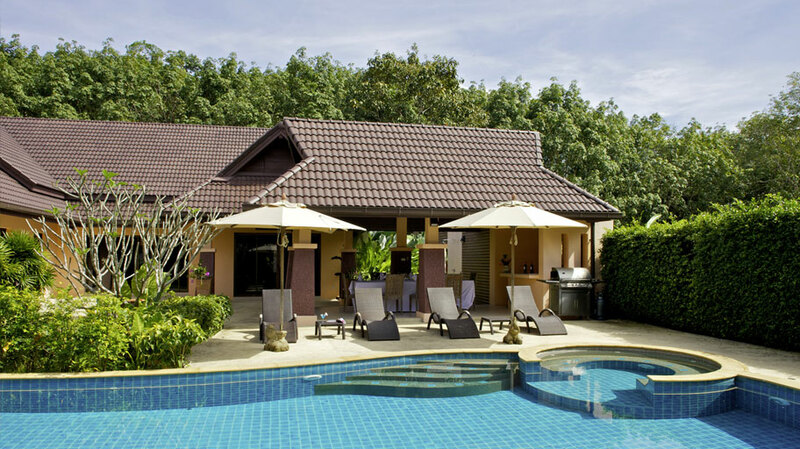 The dedicated “outdoor rooms” for both dining and relaxing poolside make Baan Zoe an ideal villa for entertaining or celebrations, whether you are planning a wedding in Krabi, or a special family reunion. The villa can be fully catered; and massage and beauty treatments are available in house. Because of its secluded location (4.4km from Ao Nang Beach), and luxurious setting, Baan Zoe is also recommended for those seeking a holiday villa that is a destination in itself, rather than a base for active sightseeing – though of course a personal concierge and villa tuk-tuk for local trips are also at guests’ disposal if and when they wish to explore. Note: Baan Zoe may be rented in conjunction with neighbouring property Baan Santi for large groups who wish to be close together.